The life-size statue can be found in the River Dodder. ALONG THE COURSE of The Dodder, a river running from Ringsend to Rathfarnham, a rather unusual inhabitant can be found nestled amongst the overgrown greenery in Milltown. 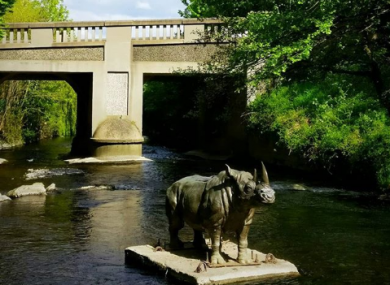 Crossing Classon’s Bridge, next to The Dropping Well pub, you may notice the striking sight of a life-sized bronze rhino, on a plinth in the middle of the river. In a relatively quiet part of Dublin, mostly comprised of residential estates, how did this rogue rhino become an integral feature of the neighbourhood? Cast in bronze, the sculptor didn’t compromise in making this piece as lifelike as possible. Each crease in its skin intricately detailed and the rhino has for a remarkably realistic appearance. It’s as though the enormous mammal escaped from Dublin Zoo, several miles from its dwelling in the Dodder. Who is responsible for this impressive artistry and why did they choose this location for their work of art? Well, the full story of the rhino remains, to this day, a mystery. In the wake of its arrival, locals assumed that the proprietors of The Dropping Well were responsible for the statue. However they have vehemently denied this. The blog Travel With A Mate reiterated that this story of the rhino is “a closely guarded secret” and that if you are to ask a member of staff in the nearby Dropping Well and you’ll find that “even they won’t give you a straight answer”. While its story may be unknown, it doesn’t make this bronze rhino, named Woody, any less important or integral to Dublin’s weird and wonderful statues. Email “Double Take: The mysterious African rhino that appeared overnight in a Dublin river”. Feedback on “Double Take: The mysterious African rhino that appeared overnight in a Dublin river”.